More than 3 million people - including more than 120,000 internally displaced people - are in continuing need of support with food, nutrition and access to health care. CARE Mali is providing support to families through cash vouchers and cash-for-work in Mopti region. Below average rainfall during the latter months of 2018 means that drought conditions are expected to worsen in northeast and central regions of the country. More than 4 million people are estimated to be affected, with over 900,000 children aged under 5 likely to be malnourished in 2019. To date, CARE has assisted more than 440,000 people with food, health, nutrition, livelihoods, water/sanitation/hygiene, and protection support. CARE Somalia involves community members (including girls, boys, elderly people, and people living with disabilities) in the affected regions in consultative meetings in order to incorporate their views and recommendations both before and during project implementation. Ethiopia faces a massive internal displacement crisis due to inter-communal violence and conflict which escalated during the second half of 2018 and due to a continuing flow of refugees into the country, predominantly from South Sudan and Eritrea. Major concerns are the shortage of food, shelter, and medicine, and lack of access to education for children. 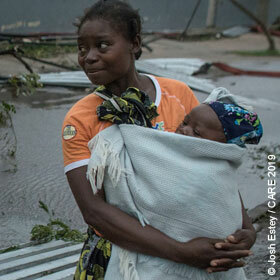 CARE has been providing food, nutrition, cash, shelter and WASH services to 630,000 people in the affected areas. CARE is currently responding to 43 humanitarian crises including the 9 large scale crises (Type 4) - see the map above. In the period October to December 2018, we reached 5.6 million people (6%) of the 95.6 million affected people in the 9 large-scale crises (Yemen, South Sudan, Syria, Iraq, D.R. Congo, Ethiopia, Somalia, Lake Chad Basin and Venezuela). Emerging crises that we are monitoring include 25 countries identified as at high risk of extreme weather impacts over the coming months due to El Nino related extreme weather. Preparations are underway in the refugee camps in Bangladesh in anticipation of the monsoon and cyclone seasons. Recent assessment places 246,000 individuals at risk, of whom 18,674 are considered at highest risk, due to precarious shelters in areas vulnerable to flood, landslide and high winds. CARE Bangladesh is developing a monsoon contingency plan for the upcoming season, in line with the site management sector in each of the camps. To date, CARE's emergency response to the Myanmar refugee crisis has reached 345,000 people, of whom 59% are women and girls.